Wiley X: the only premium eyewear brand, whose entire line is ANSI rated and EN.166 safety certified. Before purchasing any riding eyewear, look for the Z87 marking on the frame and temples and the + mark on the lenses to ensure you are getting only certified eye protection passing high velocity impact and high velocity impact and high mass impact tests. Choosing a Wiley X product you get a pair of riding eyewear that actually precedes the ANSI test u.s, making it a preferred accessory among many motorcycle riders around the world. You will recognize the official H-D® Performance Eyewear by Wiley X by the WX Z87 markings on the frame and temples and WX+ mark on the lenses. Meeting stringent ANSI Z87 standards isn't only about protection; our eyewear is tested to ensure optical clarity and accuracy from the center of the lens to the periphery. Furthermore, all lenses offer 100% UVA and UVB protection. The majority of all the H-D® frames can be fitted with prescription lenses. 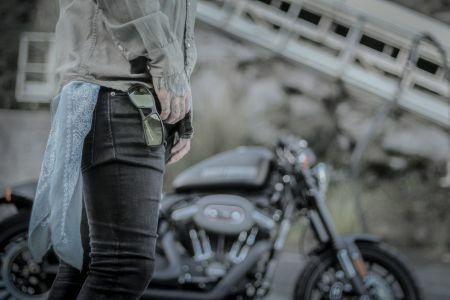 Unique to the Harley-Davidson® Performance Eyewear by Wiley X, this revolutionary lens technology provides the rider with the glare reducing benefits of a traditional polarized lens without the possible vision distorting pitfalls. This also means that reading your GPS device, mobile phone or the gas pump digits will no longer be a problem - in other words, this is the ultimate day riding lens for motorcycle riders. Many riders find these to be a one pair solution that overs their needs, whether it is for riding at daytime or at nighttime. The advanced technology of the lens makes them go darker the more sunshine (UV radiation), they are exposed to. At night the lens will go almost completely clear making it ideal for night riding because of the optical clarity.